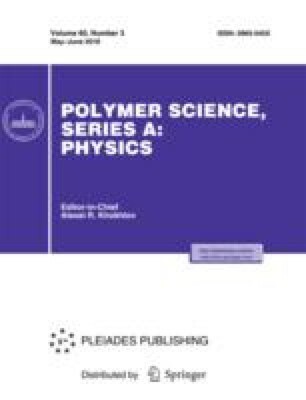 Alternate current (ac) electrical properties of the plasma polymerized o-methoxyaniline (PPOMA) thin films synthesized in the glow discharge plasma using a capacitively coupled reactor are studied. Measurement revealed that the ac electrical conductivity varies with frequency ω as ω n , where the exponent n is less than unity in the range 0.1 to 2.0 kHz, indicating the Debye type conduction mechanism in the PPOMA thin films, while above this frequency range the exponent is become greater than unity indicating non-Debye type conduction. At low frequencies the conduction is considered to be due to hopping of carriers between the localized states. The PPOMA thin films of thicknesses 100−250 nm possesses dielectric constant <10, which remains static in the range 0.1−10 kHz, and decreases at higher temperature due to the orientation polarization. The dielectric loss increases with the increase in frequency having a peak around or above 10 kHz for all the PPOMA films of different thicknesses. Cole-Cole plot between the real and imaginary dielectric constant exhibits single relaxation mechanism in the PPOMA thin films.